Lismore Aviation Expo major sponsor Fast Aviation is giving people the chance to win a scenic flight in a Cessna Caravan at this year’s event. Fast Aviation has four single tickets available on a 20-minute scenic flight for four lucky people who jump online and go in the draw to win via the Lismore Aviation Expo Facebook event page. All you have to do is tell us what you love about the expo or why you want to attend this year. The fourth annual Lismore Aviation Expo is coming up on Sunday, 29 July with aerobatics by Paul Bennet Airshows as well as joy flights, flyovers and demonstrations, static aircraft displays, market and food stalls, and loads of children’s entertainment. “We’re really proud to be the major sponsor of this event in Lismore and we are thrilled at how fast it has grown. Last year it was attended by more than 8000 people and we are expecting even bigger crowds this year,” Fast Aviation Managing Director Izaac Flanagan said. Fast Aviation launched in Lismore early last year to provide a range of services including aircraft charter, aerial work, scenic flights and advanced pilot training. “In our first 12 months we have conducted charter operations to places such as Armidale, Port Macquarie, Gunnedah, Griffith and station properties in western Queensland. We recently returned from a touring trip to outback South Australia – Lake Eyre has some water in it at the moment which is always special,” Izaac said. Izaac, who is also the Chief Pilot, said his CASA-licensed charter service is particularly suited to professionals and business people who need to travel to inconvenient locations quickly. “As an example, flight time between Lismore and Armidale is around 45 minutes, compared with a four hour drive,” he said. “We have also operated many scenic flights locally over the last year. At the moment the whale migration season is in full swing, which is always exciting to see. We will also be offering trips to Agquip at Gunnedah again this year, as well as the Birdsville Races in September. Fast Aviation also provides multi-engine and instrument rating training, a specialised area of pilot training that allows a pilot to fly without the restrictions of weather or daylight. A multi-engine instrument rating is a prerequisite for entry to the airlines. “We have put about 25 students through their multi-engine instrument rating training so far, which I’m really pleased about,” Izaac said. “We are competing against some much larger and very well established operators in the cities, but have deliberately positioned ourselves to service a niche in this market and this has paid off for us. We are solidly booked up until the end of October at this stage, with enquiries continuing to flow in. The Lismore Aviation Expo runs from 9am to 4pm on Sunday, 29 July at the Lismore Aviation Centre, Three Chain Road, South Lismore. Entry is $5 with children under 16 free. For your chance to win one of the four tickets on a Cessna Caravan scenic flight, valued at $60 each, please go to the Lismore Aviation Expo event page. 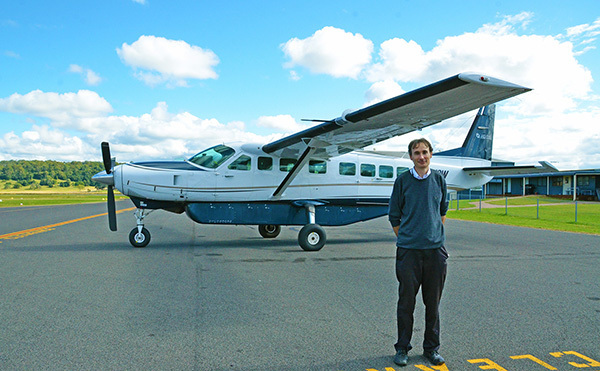 Image: Fast Aviation Managing Director and Chief Pilot Izaac Flanagan with his Cessna Caravan.